Fine Bastone Walnut. 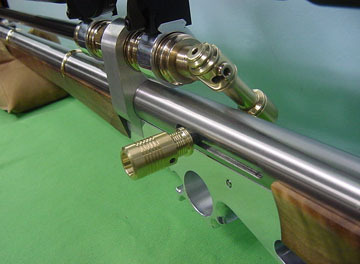 Note brass machined wedding bands attaching stocks. The receiver and bolt are Aluminum Bronze. Not brass. Brass has a tensile strength of approx. 30,000 psi. Aluminum Bronze has a tensile of 85,000 psi. Chrome Moly steel is only 90,000 psi. Billet machined trigger housing with lamb's tongue. Fine two stage trigger. Reservoir, firing valve, intake end cap and valve, and hammer tube are stainless steel. Super strength - nasty to machine. Brass machined knobs. You will note a strong family resemblance to the original 45 V-Twin. There are major differences though in the layout. This is reservoir under barrel by design. It's a stout rifle with several times the power rating of the V-Twin. This is a beast. Yes - I chose to run it at 680 fpe for the hunt. I've not explored it's limits. It was wearing this large target scope for Saturday's hunt. Actually, many things are available for sighting options. I had made Weaver ring saddles for this application. Without them, the turned bronze receiver shows more actually. 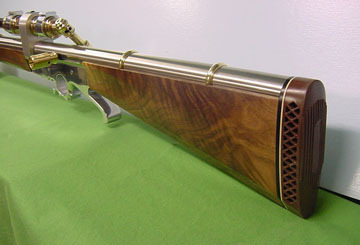 Click over for the Wild Boar Hunt of 04 using this rifle. Story to be added to as time allows. Folks were asking about the rifle so I posted this. As with everything I make, they aren't exactly catalog items, so I show you portions of development and usage stages without the huge commitment of a specific promotional campaign. One is enough for now. I've made it to use and proven it in the field. If you think you need one, we can go from there. Thanks for your interest in following along.